-All Italians assume Belgians don’t know what cooking is, let alone how to make a pasta. We are highly ranked on the Gault et Millau list, the San Pellegrino world list and in Michelin guides. Plus I remember a memorable evening where I made a delicate pasta al vongole for a couple of Italians on their boat and they swore it was better than their mama’s recipe! -Belgians assume Italians only eat pasta and pizza. -When sailing in the Mediterranean Sea it’s never cold and always light weather. I was recently victim of a storm with a cold wind between France and Corsica and I was freezing to the core. -Milan is The city of fashion so you can find any fashion object you desire. I’ve roamed the shops endlessly looking for golden shoes but ended up using Google and some vulgar e-shop. They are blind, they are attracted to heat. And I could go on like this endlessly. Anyhow… We are getting off track. This being a food blog, I’ll focus on two very interesting discoveries I had on my most recent trip through Italy. Joia is an exceptional restaurant in the heart of Milan with a Michelin star. It’s a one hundred percent vegetarian restaurant. They took us on a culinary discovery that was mind blowing. Amazing how many different tastes and textures there are in just one group of food. It’s a new movement: the gourmet vegetarians. They are creative with their (a skeptical carnivore might even say ‘limited amount of’) ingredients. But Joia topped all vegetarian experiences so far. 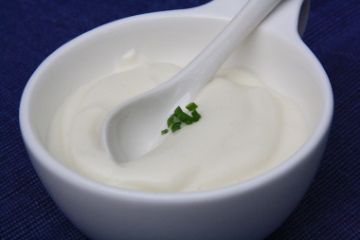 The vegan mayonnaise particularly prickled my taste buds because it was so smooth and unctuous. It was a mystery to me how one can obtain this without an egg. I always considered mayonnaise as an essential chemical transformation where you need the egg yolk for emulsification of oil with vinegar. I didn’t think it to be physically possible without egg to combine these two incompatible ingredients. But a vegan mayonnaise is basically just blended almond milk and oil, no egg needed and just as or even more unctuous. Second discovery was a lovely refreshing healthy breakfast. It’s one of the biggest shortcomings in Italy I believe; the breakfast. As I’m a breakfast girl I love to get up an hour earlier, make a nice pot of excellent tea (with real tea leaves), sit down with the newspaper and have some fresh muesli (only from Jordan’s, all the rest is crap) with delicious yoghurt and a piece of fruit. And I do this during normal working weeks, so you can imagine what I do during the holidays. Nothing makes me more sick and left unsatisfied than an Italian breakfast. Standing up at the counter of the local bar, a shot of espresso with some biscotti and off you go again rushing to work. As you can see I can get very fanatic about my breakfast. So I was very enthusiastic when T.D., an Italian friend, told me about his Kousmine diet for breakfast. I personally am very interested in discovering more about her so will try to find her book as soon as I get home. To follow the entire diet would be absolutely crazy for a foodie comme moi because she has a long list of forbidden ingredients. But her breakfast…mmm I like it! Place all the ingredients except the oil in a blender and blend until very smooth. With blender still on, carefully and slowly pour a thin stream of oil through the opening in the blender’s cover. Start with 1/2 cup of oil and continue until you reach the right consistency, up to 3/4 cup. Taste and adjust seasonings, adding more lemon juice or vinegar if you want more tang. Put everything in your favourite breakfast bowl and sit down with your newspaper to enjoy and relax at least 30 minutes before the rush of the day starts. The Hidden Glasshouse is on the move! Next story What’s in a run? Samphire!